"Is Elite Serum the best eye cream for you? Well, that depends on what your goals are. For starters, Elite Serum is head and shoulders the best eye cream for eye wrinkles. This is because it has a high concentration of Argireline, known as Acetyl Hexapeptide 3 "
•Mentioned as a safe alternative to cosmetic surgery by Plastic Surgery Practice magazine. After reading these fabulous reviews of Elite Skin, I knew I had to try it, and guess what? All the reviews were right. Elite Skin is one of the best, if not the best skin care companies I've had the pleasure of trying. is a targeted facial wrinkle reduction serum that contains a concentrated blend of pharmaceutical grade Matrixly 3000, Argireline and Leuphasyl. Additionally, it is hyper-infused with A-Lipoic Acid, which is the ultimate cell protecting antioxidant. Containing only the most potent active ingredients that are clinically proven to drastically reduce fine lines and wrinkles. The Elite Skin Eye Serum ($99) was featured on eyecreams.com That's actually how I found out about Elite Skin. After reading one great review after the next, I had to see for myself. And, after reviewing tons of eye creams on this blog, I'm gonna say this. This is the best. It's actually not a cream, it's a serum, which is better because you can actually feel it firming the skin around your eyes when you apply it. My dark circles fade, and lines are no longer there. To some, this may be pricey, but it is worth every penny. The bottle is big enough to last quite some time too. This eye serum contains a highly concentrated blend of two powerful anti-oxidants; Resveratrol and Acai Berry. As a DNA rejuvenator, it targets the ultra-sensitive skin around the eyes, including the upper and lower eyelids. This award-winning serum, called the best alternative to Botox" by EyeCream.com, works fast to treat and repair dark circles, puffiness, and wrinkles below and around the general eye area. 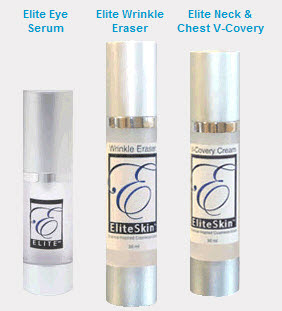 The Elite Neck and Chest V-Covery ($79) is hopefully saving my skin from my worst fear. A turkey neck! Nothing looks worse then skin hanging from around your jaw and neckline. "When it comes to the symptoms of aging, the skin on the neck and chest responds differently than the skin on the face. This is because the skin on the neck is laying on a very fibrous fascia-like sheet. So when the aging process sets in, the skin responds by wrinkling faster than other parts of the body. Furthermore, the chest responds to sun damage with wrinkling and hyper-pigmentation. " And just like all the other Elite products, not one bad review in the bunch. Everyone agrees Elite Skin is #1. And I hate to jump on the bandwagon, but they are SO right! If you don't take my word for it, read the testimonials. Everyone is loving Elite Skin. You can buy their products at Eliteskin.com One you are a customer, you will receive a login where you can not only track all your previous purchases, you will get special monthly discount codes! To win, visit Elite Skin.com and tell me one thing you learned, and which product your most interested in! This is mandatory, but well worth the fabulous prize we're giving away!! Follow me on Twitter and Skinpro, And Share with your friends either via Twitter or Facebook (can be daily) for one entry each! You can use, "Win $200 worth of eyecream.com's #1 product!! Elite Skin Review + Giveaway: http://bit.ly/bpHIy9 #giveaway"
That's it beauties! This is a huge prize, and you will love your results! This giveaway will end 8/30/2010. Open to the US only. No Po Boxes please! Winner will be chosen by random.org and will have 48 hours to respond to the winning email. Good luck! The one I would like to try is the DNA Rejuvenation System that actually repairs your DNA. Following you on Skinpro's twitter. "Typical results consist of a significantly tightened neck and chest area, considerably firmer skin, an overall reduction in wrinkle depth, and a more youthful look around the eyes." I learned that they have a six month back guarantee. The product I am most interested in is the Elite Ultra Cleanser! I would like to try is the DNA Rejuvenation System that actually repairs your DNA. Telomeres, part of the DNA structure, grow shorter as cells replicate; and as they shorten, cells (in particular, skin cells) begin to enter a senescense or aging state, which produces wrinkles. This product won the 2009 Reader's Choice Award from Yoga Magazine. I learned that Alpha Hydroxy Acid comes from sugar cane. I would like to try the Elite Ultra Cleanser. I follow you and Skinpro on Twitter @mgoss123 and tweeted. Id like to try the DNA rejuvination system. They won the Yoga Magazine readers choice award in 2009. I learned that they offer a Complete 6-Month Money Back Guarantee. Thanks for the great giveaway. I learned and am very enthrolled about The DNA Rejuvenation System is a highly advanced biocomplex consisting of three products that are clinically proven to promote rapid skin cell regeneration.I would likt to try the elite eye serum. I am interested in trying the The DNA Rejuvenation System to help firm my skin. I learned...EliteSkin™ products are manufactured in a state of the art 70,000 square foot facility in Miami, Florida. I would love to try the Elite Eye Serum because I learned it is called the Best Alternative to Botox - def want an alternative that works! I'd like to try the Elite HGF Youth Serum. They have a 6 month money back return guarantee. I'm most interested in the Elite Wrinkle Eraser. I learned that this is the only combination of pharmaceutical grade skin care products that has been specifically formulated with an award winning Synergenic Effect™. Accordingly, this is the only combination of pharmaceutical grade skin care products that has been specifically formulated with an award winning Synergenic Effect™ that delivers unparalleled, exponentially enhanced results. I would love to try the DNA Rejuvenation System sounds great.I learned that it Contains only the most potent active ingredients that are clinically proven to drastically reduce fine lines and wrinkles. That is some great products thanks for the contest. What a great set of products that work together as a complete system! I've been reading about telomeres and would love to try the telomere cream and experience it myself. I learned they received the 2009 Editors Choice Award from Yoga Magagine. I'm most interested in the Eye Serum. I'd love to try the Elite Neck & Chest V-Covery. I'm following with Google Friend. I learned they have FREE FedEx Express delivery on all orders over $200! I would like to try the Elite Telomere Cell Cream. I would love to try the Elite Ultra Cleanser with Alpha Hydroxy Acid and Biomarine Seaweed Extract! I learned that Matrixyl®3000 is meant to help reduce deep wrinkles, such as those found on the neck. I'm most interested in the Elite Neck & Chest V-Covery. I would love to try the Elite Telomere Cell Cream...I learned that in order to protect the DNA of skin cells, the Elite Telomere Cell Cream works to prevent the senescence of cells by enhancing cell funtion and improving the quality of the tissue. This extends the youth span of the skin, whereby reducing all visible signs of aging, not just wrinkles.